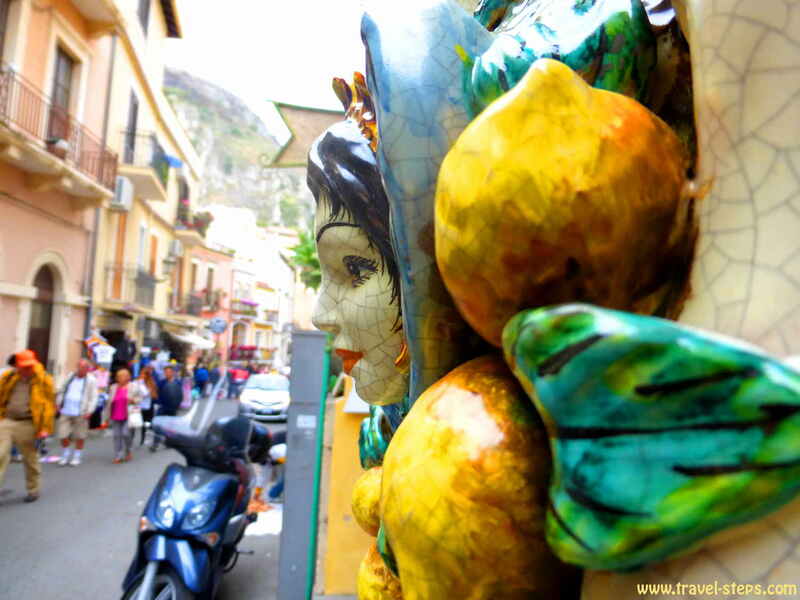 Backpacking around Sicily on a budget can be fun. I went backpacking around Sicily in May 2015 for more than one week as a solo female traveler. One week traveling around Sicily is enough time to get at least a taste of Sicilian lifestyle. 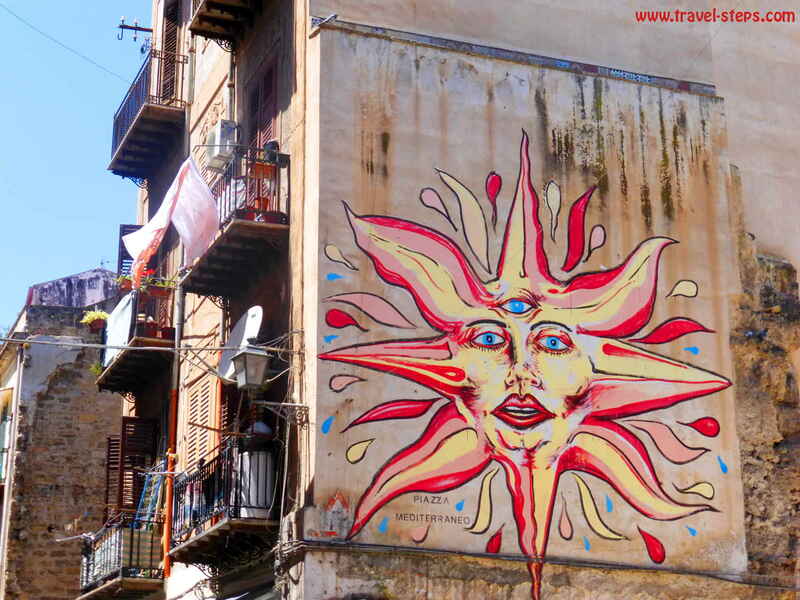 The sunny south of Italy is an island full of street art, flowers, fascinating landscapes and architectural world heritage – and it is the home base of the Mafia. Nonetheless, the locals are relaxed and no, really no one tried to steal my handbag. Sicily in general is a great backpacking destination. It is easy to get around by public transport. There are trains and buses going to all major destinations. There are hostels waiting for travelers. Markets, nature, architecture, beaches, cheap pizza restaurants for budget travelers and nightlife. 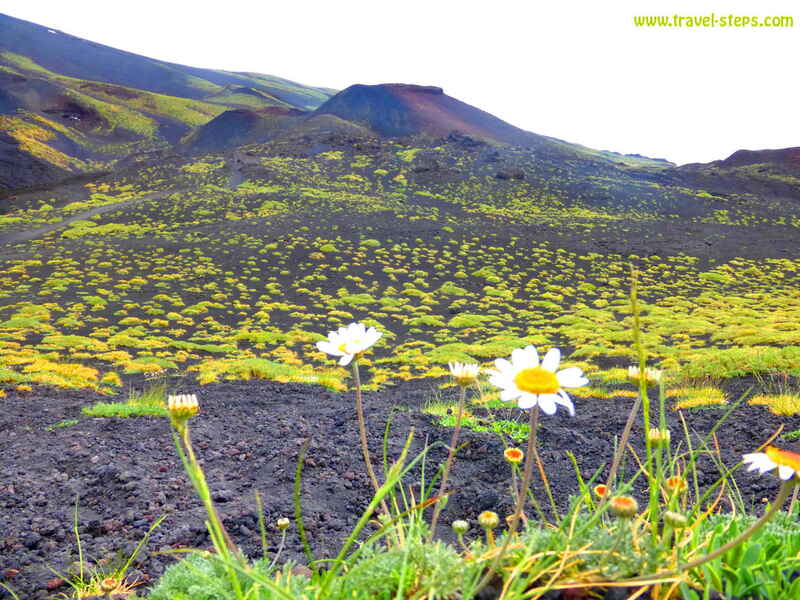 Moreover, it is not a problem for independent solo female travelers to go backpacking in Sicily. 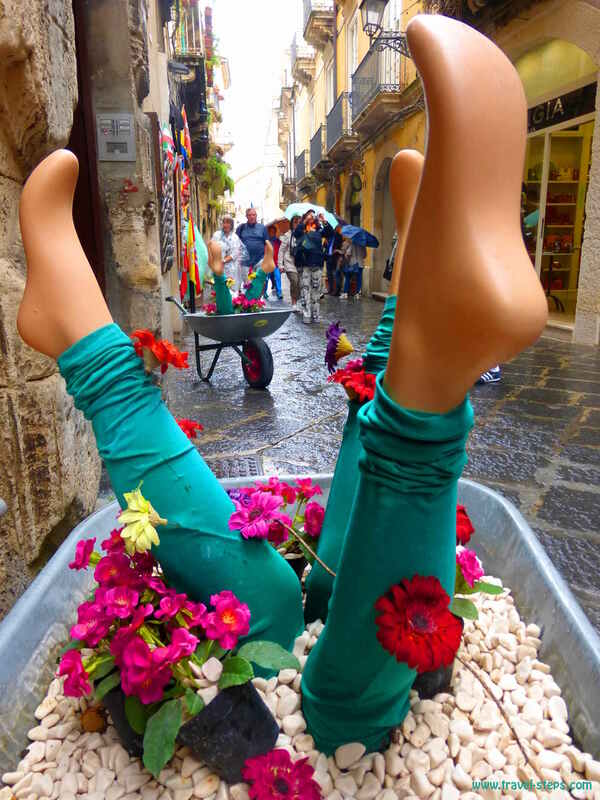 I was fascinated watching bodies in the Catacombe dei Cappucini of Palermo, enjoyed swimming at Mondello Beach, explored the markets in Catania, the old town Ortygia in Syracusa, the flower festival in Noto, Isola Bella in Taormina and the famous volcano Mount Etna. And May is already a great time of the year to travel to Sicily. 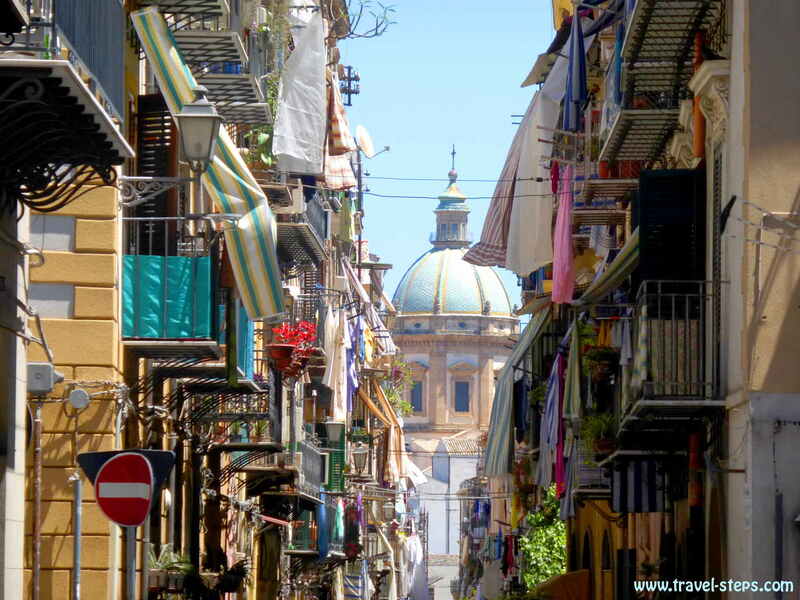 I started my budget backpacking trip around Sicily in Palermo. I loved Palermo from the first moment. Well, maybe from the second. But concerning the cities, it was my favorite place in Sicily. I arrived early in the morning by bus from Brindisi at the bus and train station at Piazza Giulio Cesare. I had survived a horrible, far too long and rough ferry ride from Albania. I had desperately line-jumped at the immigration to Italy, because the ferry arrived a few hours late and I had to catch my pre booked night bus to Palermo. Unluckily, at the bus station in Palermo, no one could help me with directions to my hostel. I had been too stupid to write down the address of my hostel. I just knew the name. That was not enough. No wi-fi anywhere. Not even in a nearby café. No one spoke English. But the staff at the train office had been really helpful. A friendly smiling guy working at the bus station luckily gave me at least a tourist map. Get information about trains and buses in Italy. 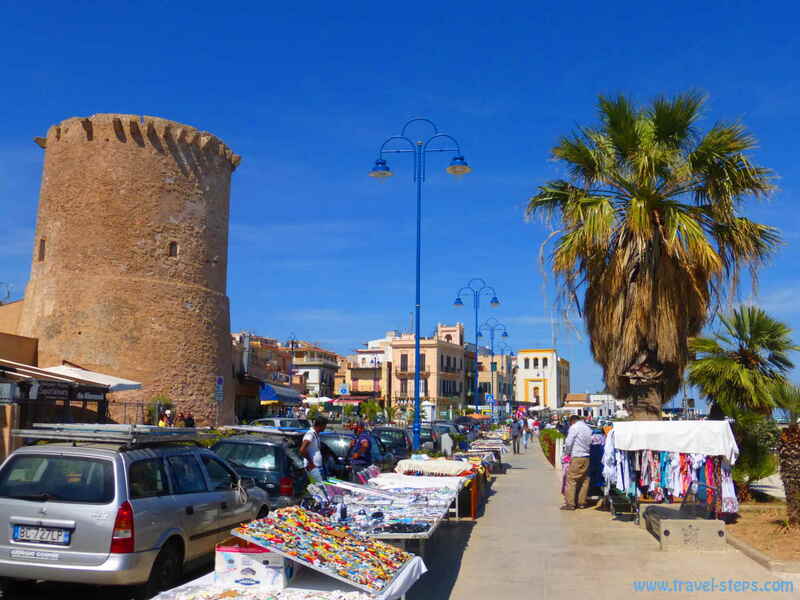 I was happy to find out, that it was just a 15 minutes walk from the train and bus station to the Vucciria Hostel situated in the Vucciria quarter. A helpful guy in a coffee shop had offered me his mobile phone to check the address online. Easy. Now, I was able to relax. Warm morning sunlight was touching the buildings gently. Some people were already on the way to by fresh fish or to have quick coffees standing around in one of the espresso bars. Market stalls attracted customers. 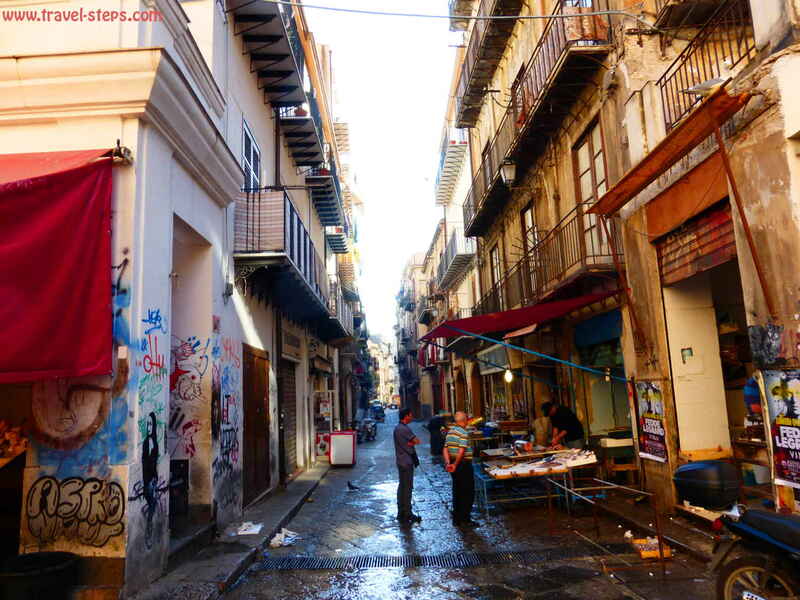 It is well worth walking around Palermo early in the mornings. 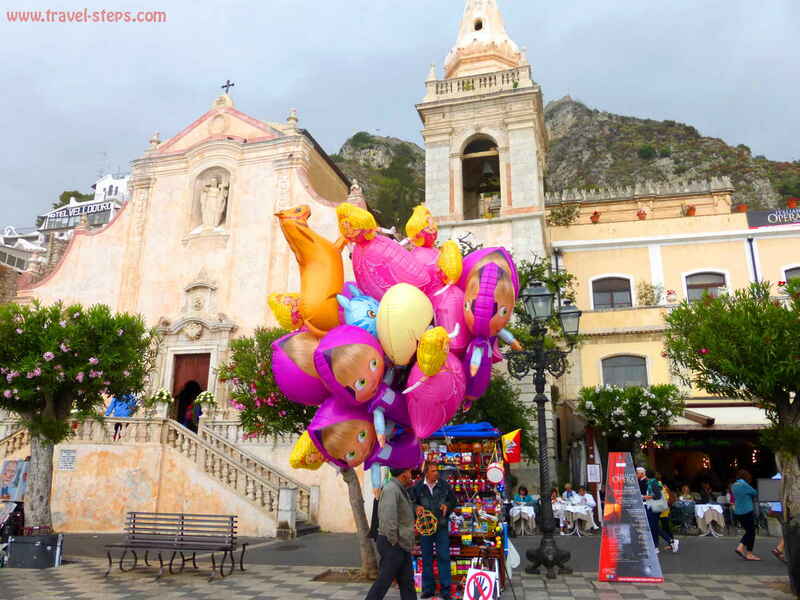 The atmosphere in Palermo was chilled out, the architecture just beautiful. I had to ask a few local to find the right street to my hostel. Then, I found the Vucciria hostel. The facade looked old and as if the building needed renovation. No sign outside, just a door bell. I had to walk up a few floors. Narrow stairs. I got exited and was very surprised to finally enter a colorful creatively decorated big bright flat with some cool people welcoming me. There was even a big room, which looked perfect fo yoga or some meditation. The Vucciria hostel was basically consisting of two dorm rooms integrated into the flat. The guests shared bathrooms and kitchen with the owners – a mother and her 25-year-old son. Maybe a bit unusual, but the hostel turned out to be a nice and familiar place, where I got to know the owners and all the other guests immediately – all individual travelers from different European countries. 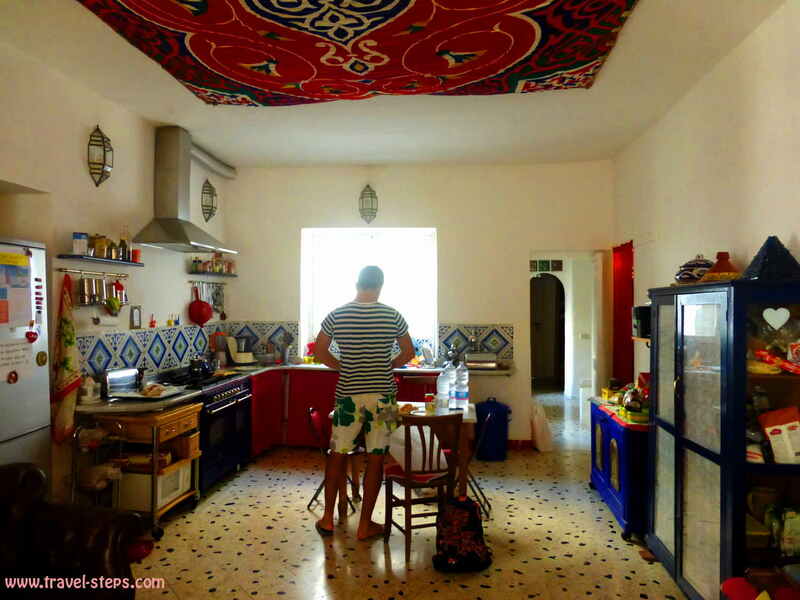 It was definitely a good place to meet people and to start experiencing authentic Sicilian life as the hostel is set in a very lively neighborhood. There were some bars around, which attracted a lot of young people to hang around there at nighttime. There were open air tables and people playing table soccer. You could get beers for around 1,50 Euros for a bottle. But it’s probably not a good place for those in need of a lot of privacy and silence. The owners of the Vucciria Hostel made me a coffee, although I arrived very early. After I had a shower, they invited me to come to the Mercato di Ballarò with them to do some groceries. Faster than I could think, I got a helmet on my head and sat on the back of a motorbike. It was fun. It was great. The Mercato di Ballarò was amazing. Spices, fresh fruit and vegetables and a lot of people in between. 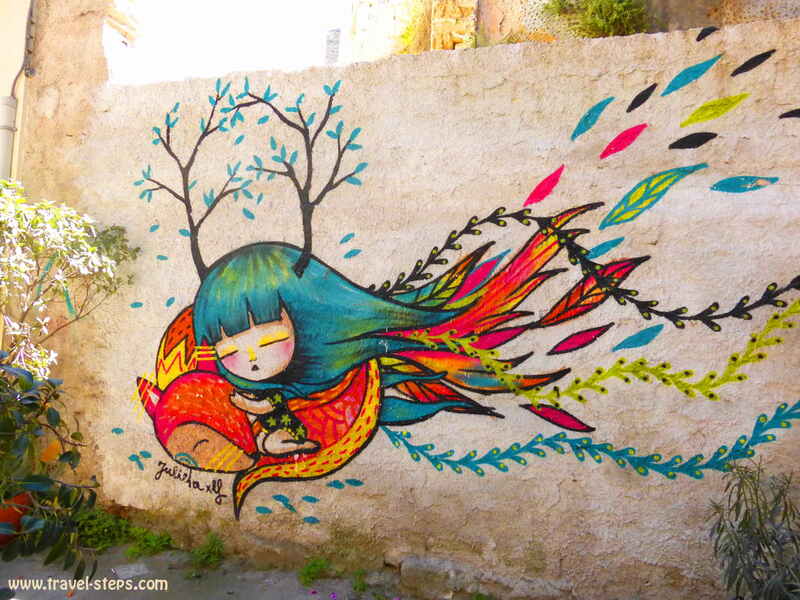 On the way: a lot of run down buildings with cool paintings on it. 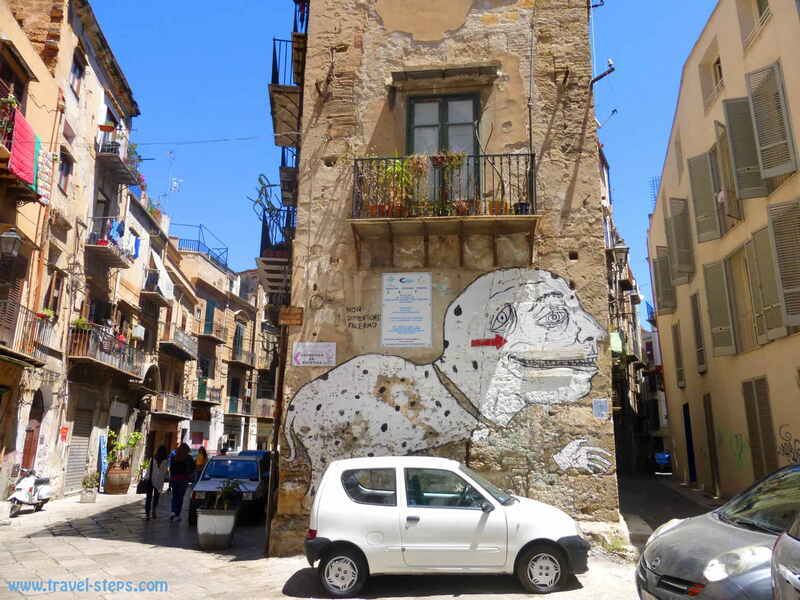 Yes, Palermo has fascinating architecture, but some of the buildings look as if they will collapse soon. Others have already collapsed or had been pulled down. Some more facades start to crumble. That all creates a special vibe, that makes Palermo certainly unique. And there is no question, that Palermo is one of the most beautiful cities, that I have been to while backpacking in Europe. Maybe even, because it’s not perfectly renovated. It’s real. It’s colorful. It leaves space to discover and to use your fantasy. There is space for artists. It attracts very different people. To be honest, I haven’t seen a lot of people wearing haute couture in Ballarò and Vucciria. There is an alternative scene. The quarters might appear to some travelers slightly rough. The party in the evenings sometimes starts next to piles of garbage. In general, Sicily clearly has a garbage problem. 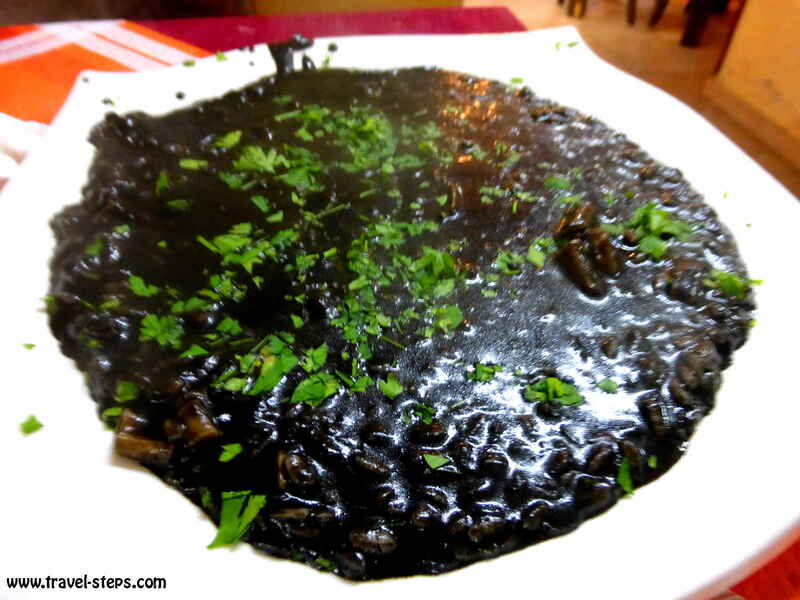 I made some interesting dinner experiences in the lively streets of Vucciria, where I tried the most horrible food ever, the “Risotto al nero di seppia” (black squid risotto) in a small local trattoria. I was curious, so I ordered it. But I had to fight to get a few bites into my stomach. 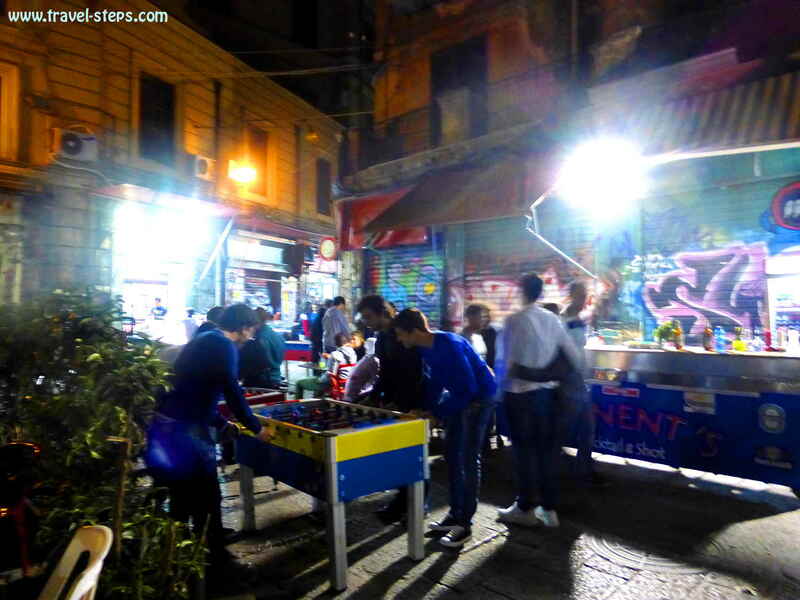 In Vucciria, I also found a lively street with a lot of cheap restaurants next to my hostel. If you are on a tight budget, you can manage to eat a pizza for 4 Euros. During the day, I always found panini stalls at the street, where I tried nice vegetarian panini for 2 or 3 Euros. 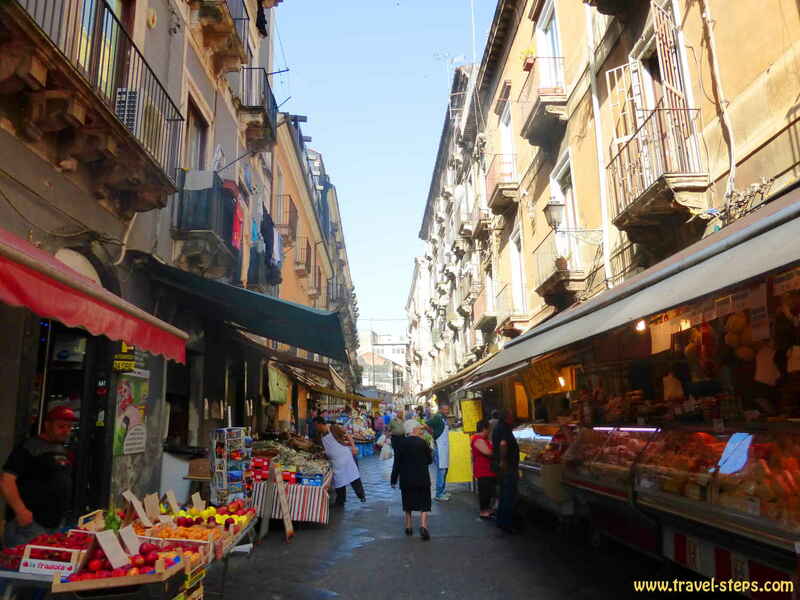 Also the Mercato di Ballarò as well as the other markets offer a choice of street food and fresh fruit. One time, I bought bread in one shop, went to another shop to buy a few slices of cheese and a tomato in the third one. It was nice. It made the shop owners laugh. Interested in the place, where the living meet the dead? I definitely was. For me, the Catacombe dei Cappucini was one of the most impressive sights in Palermo. You can cool down in the company of countless corpses, some of them still fully dressed, while the sun is burning outside. Most of the corpses were hanging at the walls of the hallways. I was fascinated and felt repelled at the same time. In the end, you can witness the outcome of the ancient tradition of mummification practise, that has taken hold particularly in Sicily. It’s all human. It’s real. And it costs 3 Euros to get in. Although, it is very tempting and a lot of people cannot resist, taking photos is strictly forbidden. Some cameras watch you in there. 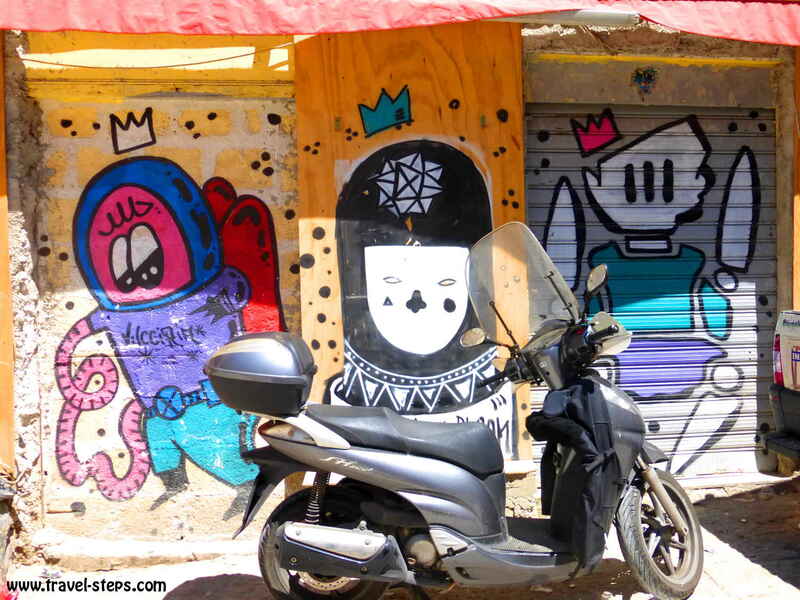 But also on the surface, it’s definitely worth walking around Palermo. Yes, there are must-sees like the Palazzo Reale, but I saved the entrance fee and just walked by. I simply didn’t feel like ticking it off my sightseeing list. I rather enjoyed the atmosphere in the streets, had some ice cream, took some pictures, just drifted through the small lanes. 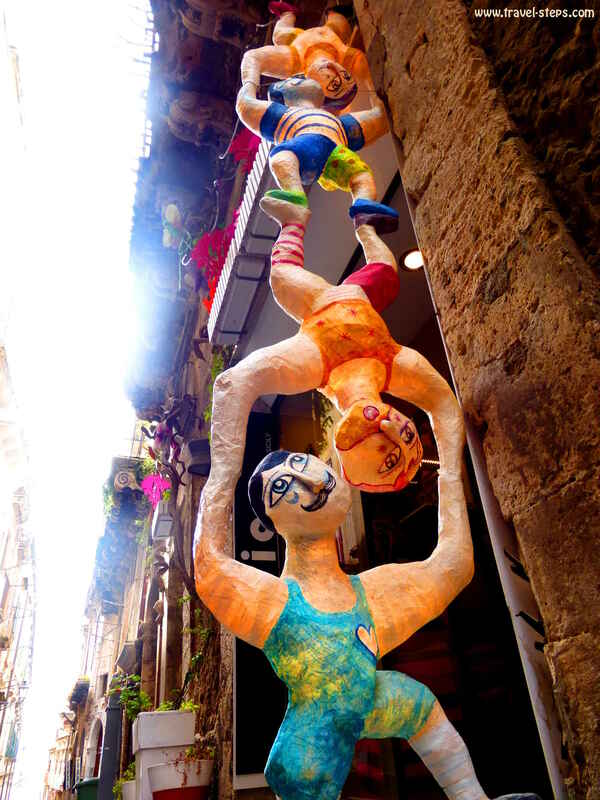 In one of these lanes, I discovered a puppet theater, where the audience can watch a Sicilian way of art, that has 2008 declared part of the List of the Intangible Cultural Heritage of Humanity by the Unesco. In general, you don’t need a lot of money to fully enjoy the city. The historic buildings caught my eyes. 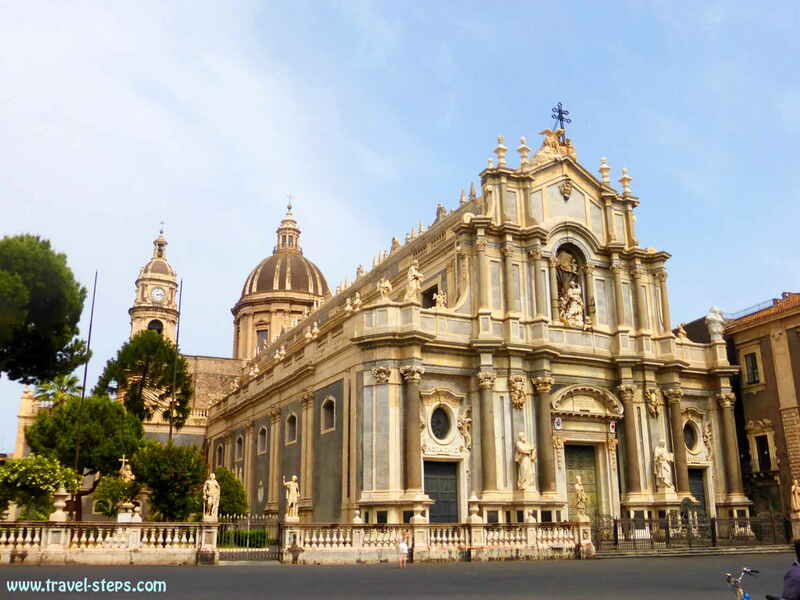 The impressive Cattedrale di Palermo and a lot of churches open their doors for free. Piazza Pretoria is a classical photo stopover. There, you also find the helpful multilingual tourist information. 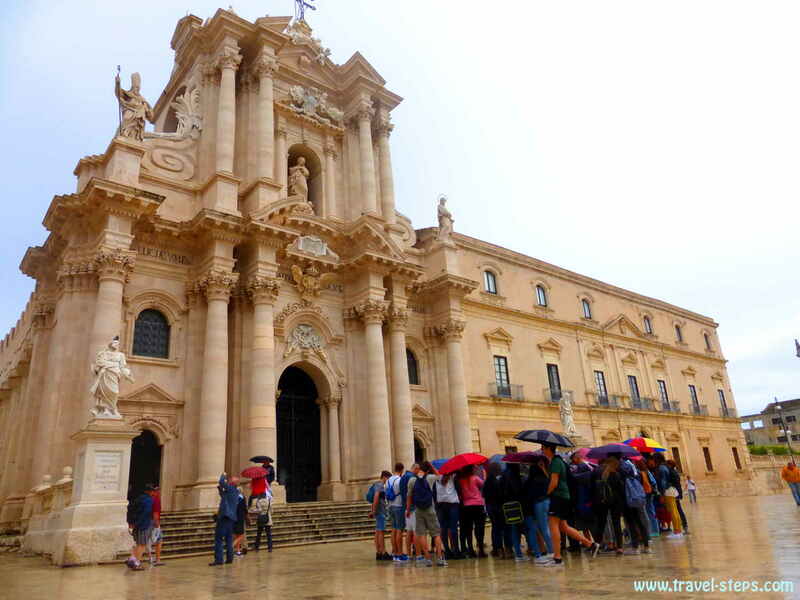 The staff helped me with free maps and a lot of information about bus timetables for example for buses to the famous Monreale church as well as Mondello beach. Palermo: Care about your safety at night! Well, the Mafia is still present in Sicily. Tourists will probably never notice, if they have met one of the organization or not. Still, it is not a subject, that locals like t discuss in public. Paying protection money to the Mafia is a common practice, although some businessman get organized refusing to pay. I saw some maps, that show “addiopizzo” places, shops, restaurants and hotels, whose owners claim not to pay protection money. But some people even doubt, that every one of them is really not paying. Apart from that, at night, I wasn’t very sure, how safe it is to walk into dark lanes. I’ve heard some stories about tourists getting robbed by scooter drivers. But well, personally I haven’t had one bad experience anywhere during the last years of traveling. Still, in Sicily, I didn’t do any long walks at night-time completely by myself. I met enough travelers to go for dinner or drinks with. But no worries, there are illuminated streets and squares with lot’s of nice restaurants. Get some helpful advise about safety at night here, today’s Mafia and read more about the campaign against the Mafia’s protection money. Even in May, it was hot in Palermo. And after a long walk through the city, I felt like jumping into the water. 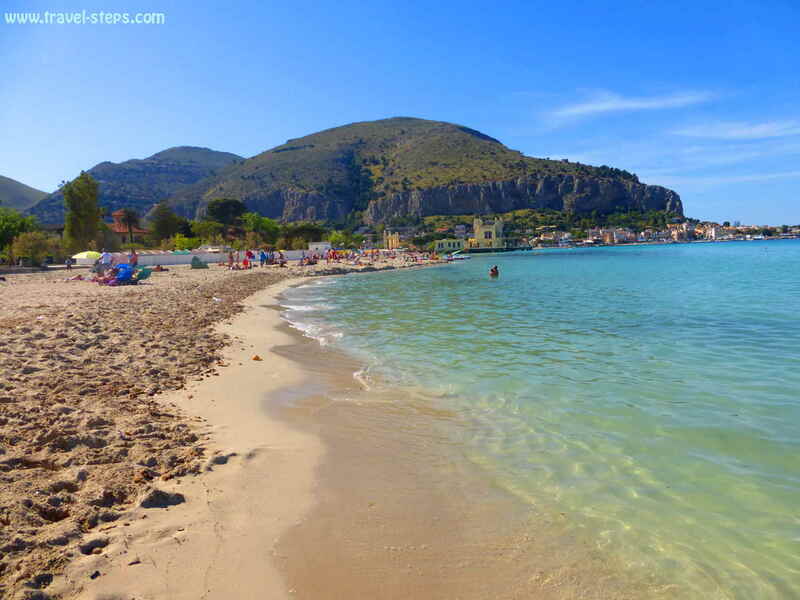 From Palermo’s city center, I took the bus 806 to Mondello Beach to go for a swim. The bus leaves the Piazza Sturzu regularly. It takes about 30 minutes to get to the famous stretch of white sand. Easy. The bus stops directly at the beach. So don’t worry about missing the right moment to hop off. I walked along the promenade and looked for a nice spot to swim. There are a lot of beach clubs with sun beds and umbrellas, changing cubicles and lockers, that you can rent for up to 20 Euros per day for two people, but some places charge less, if you arrive later in the afternoon. These places were pretty empty at a weekday in May. I preferred to put my towel at the busy public beach. But I was allowed to quickly use the beach club changing cubicles for free, when I asked the guys at the entrance politely. I just wanted to stay at the beach for a short time. That is, why I didn’t want to pay for a sun bed. Most people just took blankets or towels and laid down directly in the sand in the public beach areas between the clubs. Probably, these free areas can get very busy at weekends and in high season. For me, it was perfect. When I went into the shallow clear warm water, I just asked people to watch my stuff and left it with a young couple. If you carry valuables like camera and money with you, I wouldn’t recommend to leave your things there without paying attention. But this way, it was fine. The water was great, the atmosphere relaxed. Mondello beach is certainly a place with a lot of action going on. And afterwards, I went on walking on the promenade to see the rest of the beach area. If you need new sunglasses, this is the place to be. The souvenir sellers were already waiting for me. To get back to the city by bus, I had to look for the right stop and had to walk to the promenade’s parallel road. The nicest way to see Palermo’s coast is definitely by boat. When the owner’s of the Vucciria Hostel asked me, if I wanted to take part in a sailing boat trip, I was happy to join. It was a special price of 15 Euros per person and we were eight people including the hostel guests, the skipper and his friend. The two young Italian men had just started to set up a small business offering sailing boat trips for hostel guests on their own boat. 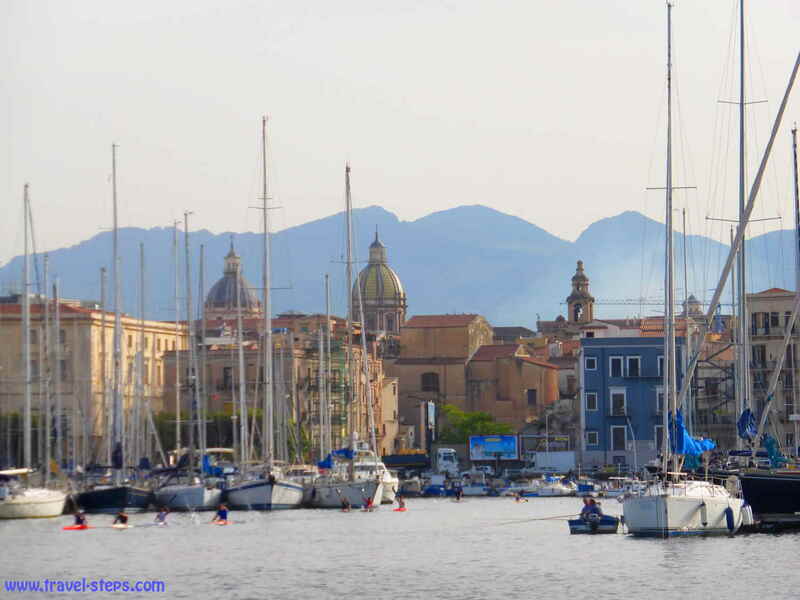 It was cool not just to watch Palermo’s marina, but to hop on one of the small boats. 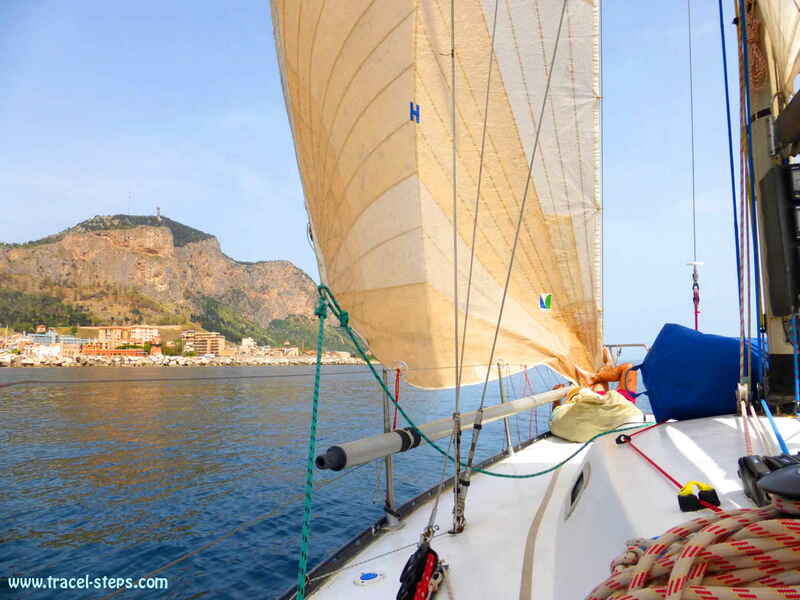 Compare prices of sailing boat trips around Palermo! The sailing trip around Palermo’s coast was pretty cool. This way, we were able to jump into the water close to Mondello beach and to sunbathe afterwards on deck without caring about fees for sun beds and umbrellas. Different people and companies are offering sailing boat trips at different prices. You find some even online. It’s probably worth asking at your hostel or hotel and compare the offers. Someone might know someone who knows someone, who can take you onto a boat for a good price. The harbor in general wasn’t very picturesque. Some guys were fishing there, some seagulls were eating rubbish. And to get there, you have to cross a multilane busy street. Zebra crossings generally don’t mean lot to Italians. 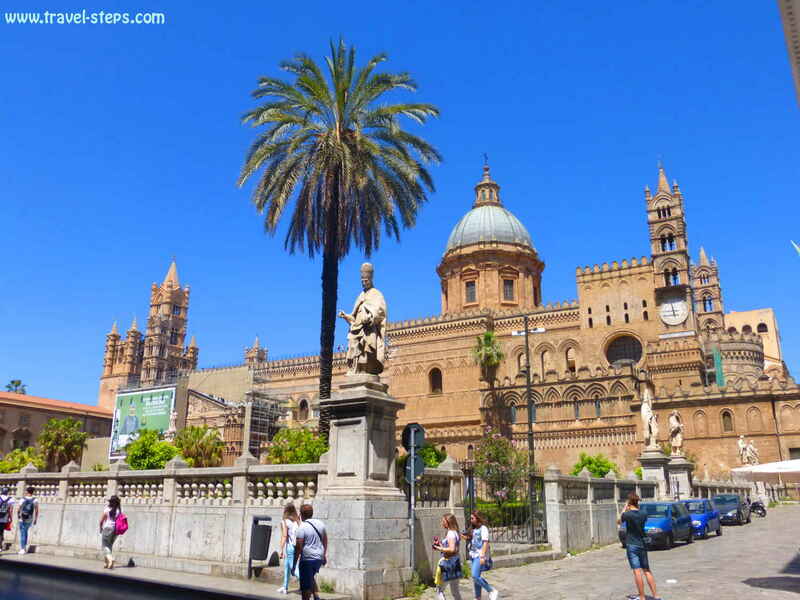 I wasn’t a big fan of Palermo’s seafront, but close to the water, there were still a few interesting buildings to discover, churches to see, massive trees to hug and ice creams to eat. 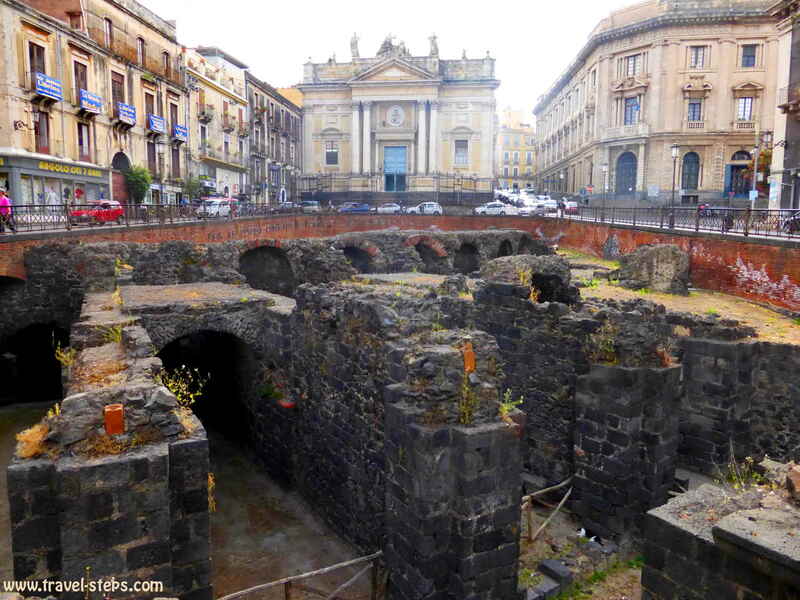 After four days in Palermo, I took the train to Catania. The train ride was nice. 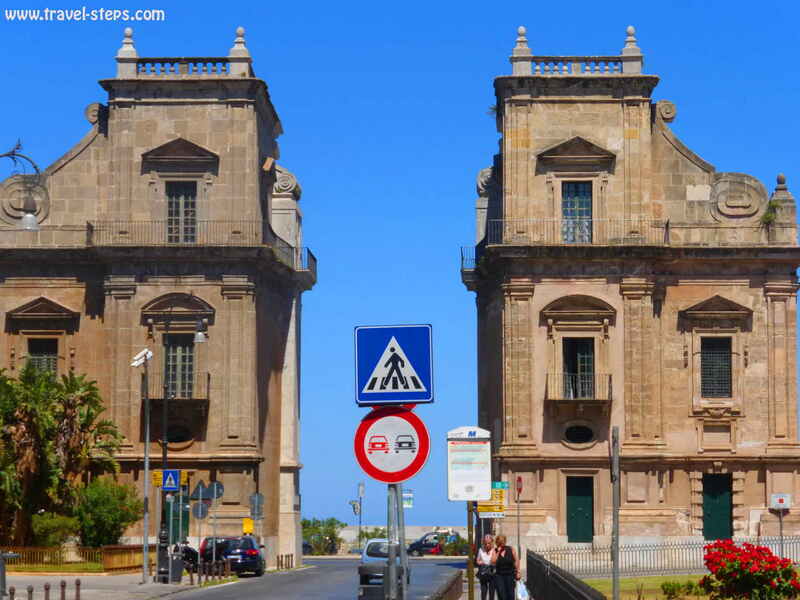 It is very easy to get around Sicily by train and bus. As long as you don’t want to stay on campsites or to discover hidden beaches, there are good bus connections between towns. It is definitely not a problem or too expensive to get around as an individual traveler. But when I arrived at the train station, it was again almost impossible to get some information in English. I tried French, but wasn’t lucky either. Well, I was in Italy. Sure. But after I haven’t had any problems communicating somehow in Croatia, Montenegro and Albania, I was seriously surprised to walk into a Mexican standoff in a member state of the European Union. Take an Italian dictionary on your backpacking trip to Sicily! In Sicily, you have to be in generall very lucky to meet someone speaking English. Although there are a lot of tourists from all over the world, don’t expect the locals to be able to speak English. In hostels, it was perfect. But in daily life it was very difficult to make myself understood. Rather take a dictionary or learn a few helpful sentences in Italian. I just needed information about which bus to take to get to my hostel. I just knew the street name, but not the right bus stop. It took me ages to make myself understood. In the end, I sat in the right bus, but the helpful bus driver made me get off far to early. I tried to ask in a café for the direction the hostel. They knew the hostel, but because of my lack to communicate in Italian, they couldn’t explain the way to me. In the end, a man walked with me to guide me into the right direction. I was slightly embarrassed, but overwhelmed by the helpfulness of the locals. The Agora Hostel in Catania was alright, but quite anonymous and busy with German teenagers staying there on a school trip. The dorms were cramped with far too any beds, but luckily there were just two more girls staying in my eight-bed-dorm. 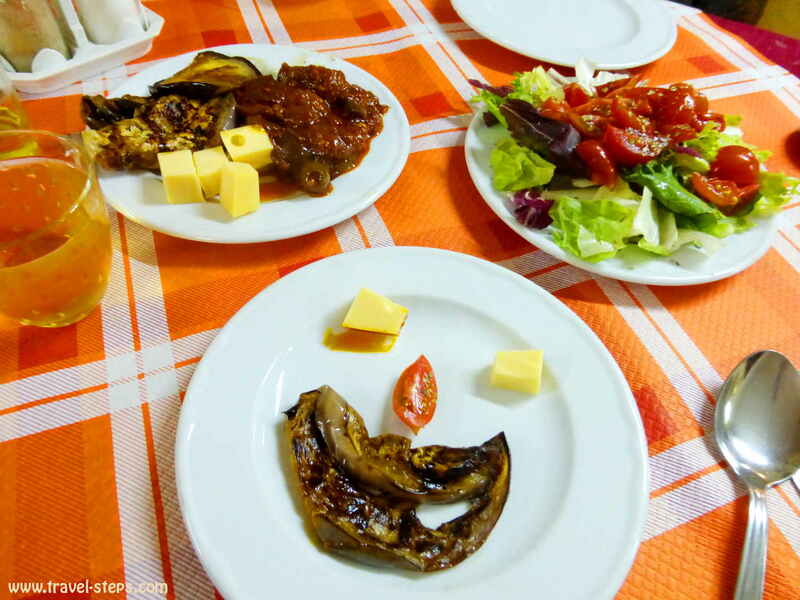 It wasn’t even 10 Euros for a night including a simple breakfast, which was a very good deal in Catania’s city center on Piazza Curro very close to the Piazza Duomo. The bar and restaurant downstairs attracted every night also a lot of Italians, mainly young people, who like to party. There are special drink and meal deals for hostel guests. And yes, after I few days, I met nice international travelers in the common room. Catania’s vibe was different from the atmosphere in Palermo. Somehow less familiar. Maybe, it really had to do with the accommodation as I had have a really good time in the flat like hostel in Palermo with super friendly owners and very communicative guests staying there. In Palermo, I was right in the middle of the action from the start. In Catania, I had to make my way by myself. No one paid attention to me in the hostel as usual in these big places full of anonymous dorms. I walked around the city’s heart, Piazza Duomo with the fountain of the elephant right in the middle. Beautiful baroque architecture. I understood, why the city belongs to the Unesco World Heritage. But with its perfect facades and broad streets, it didn’t catch me. The markets in Catania instead made me smile. 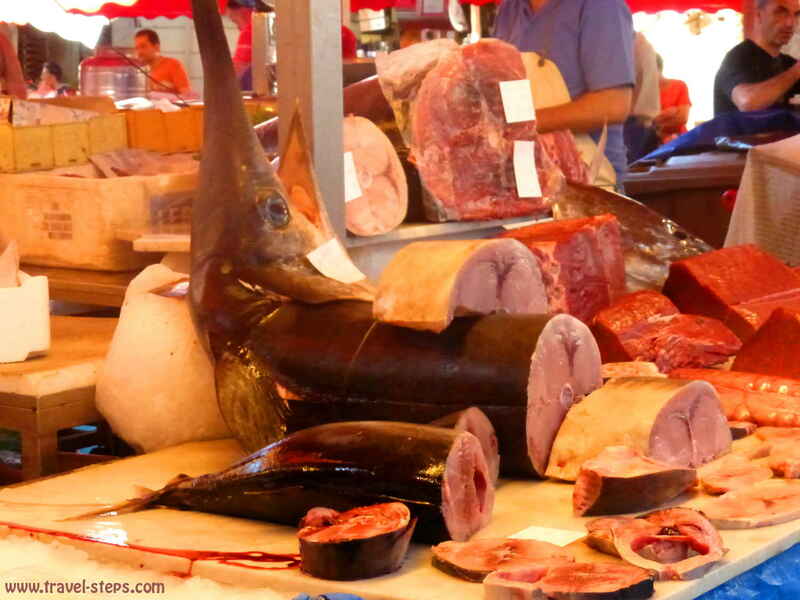 Lot’s of swordfish, muscles and squid, fruit, vegetables and good vibes were to find early in the mornings except Sundays on the fish market La pescheria close to the Piazza del Duomo. 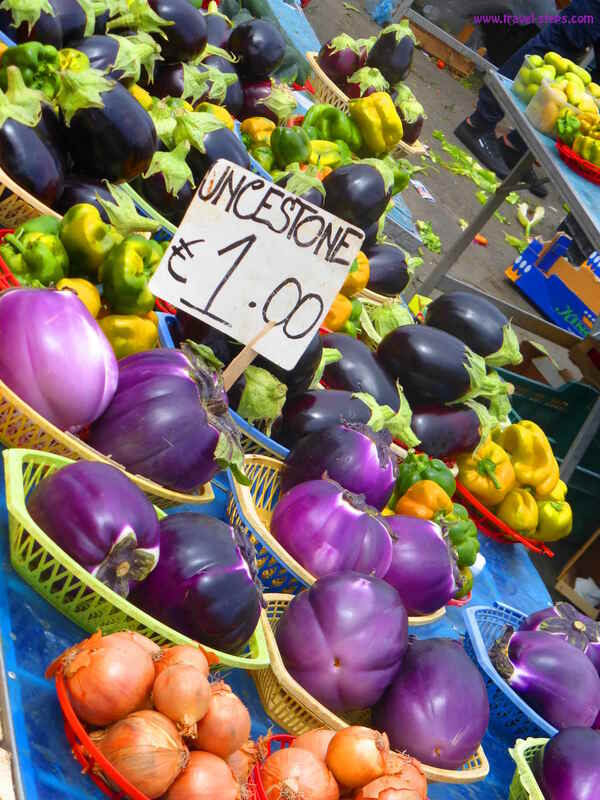 For clothes, shoes, jewellery and household goods, fruit and vegetables the locals go to the market “Fera o Luni” on the Piazza Carlo Alberto Mondays to Fridays from 8am to 2 pm and Saturdays till 6 pm. I liked the place and spend a few hours there. A good place for travelers on a tight budget to get cheap summer clothes. Don’t forget to bargain. On my first day, I had a antipasti kebab in a Takeaway fast food place on Via Etna. Interesting idea, but very tasty. I saw a lot of places like that in Catania and was happy about that. As long as I don’t have company, I usually don’t spend a lot of money on food. So, sometimes, it’s just about filling the stomach, which wasn’t a problem in Catania. One of the reasons, I came to Catania was to visit Mount Etna. To get information, I went to the tourist information in Via Etna. A friendly smiling woman tried to help me. Again, she didn’t speak anything else apart from Italian. I was used to that by now. Still, I don’t understand that. That is the basic skill, everyone working in tourism should have. It’s all about understanding the needs of the tourists. 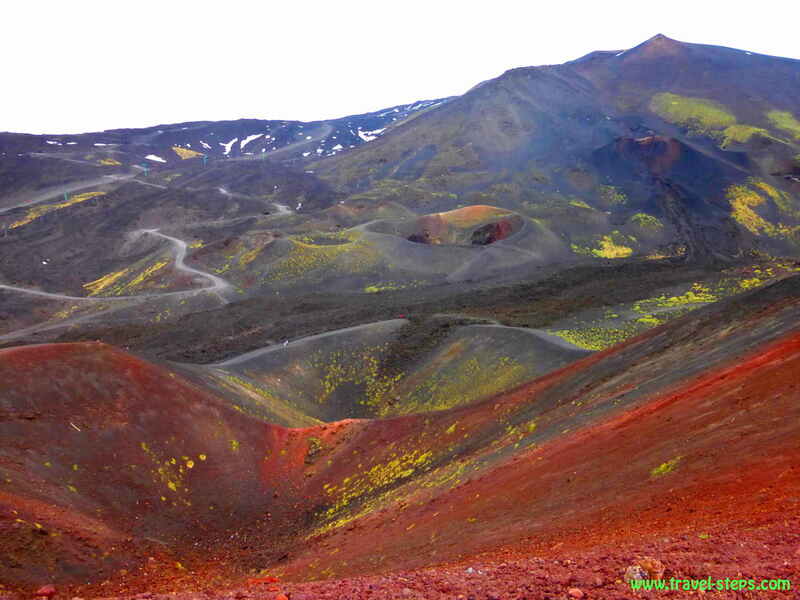 At least, she got an English speaking colleague from the back office to inform me about the ways to get to Mount Etna. If you have your own transport, just drive up there, lucky you! If you don’t, there is a public bus of the company AST every morning at 8.15 am leaving Catania from Piazza Papa Giovanni XXIII, the central station square. It leaves Mount Etna again at 4.30 pm. From June 15th till September 15th, there is a second bus leaving at 11.20 am from Catania and one returning from Mount Etna at 11 am. The AST bus company has an office at the central station square, where you can buy a ticket in advance. Instead of just taking the public bus to the Etna volcano, I was stupid and booked a tour at my hostel for more than 40 Euros. It was seriously a total waste of money. And I got frustrated. Maybe, there are good tours out there, but I got a crappy one. It was just me, an older Irish couple and the guide. Okay, still better than sitting in a tour bus with 50 people, but in the end, we didn’t do much else. We drove to the crater park and walked some circles together with the other tour groups and had some nice chats. I looked jealously at the people, who just came by bus and bought tickets to use the cable car further up almost to the top of the Etna volcano to get an even nicer view. The landscape was seriously stunning. But I had to stick to my tour group and a fixed plan. Well, I didn’t have to, but I was too lazy to walk away and not in the mood to pay for any extras. Afterwards, we drove to a different viewpoint and saw some steam, climbed into a little boring crater cave and went to a tourist shop, where we were supposed to buy some olives and oil like all the other tourists, that were brought into that shop with big tour buses. I was just traveling with hand luggage and was quite sure, that I wasn’t allowed to take some liters of oil with me into the plane. So, I did the free tasting in a shop as a part of the Etna tour. I tasted a lot. I was really hungry by that time. And the products were really good. The free tasting took place in a shop, where big tour groups stop for shopping. And of course, hungry backpackers were not the people, the shop owners were waiting for. But well, the tour was over early in the afternoon anyway. I tried to take it with humor. And yes, the Etna volcano is a very big tourist attraction. There are really a lot of people around. It got the feeling being in a theme park. 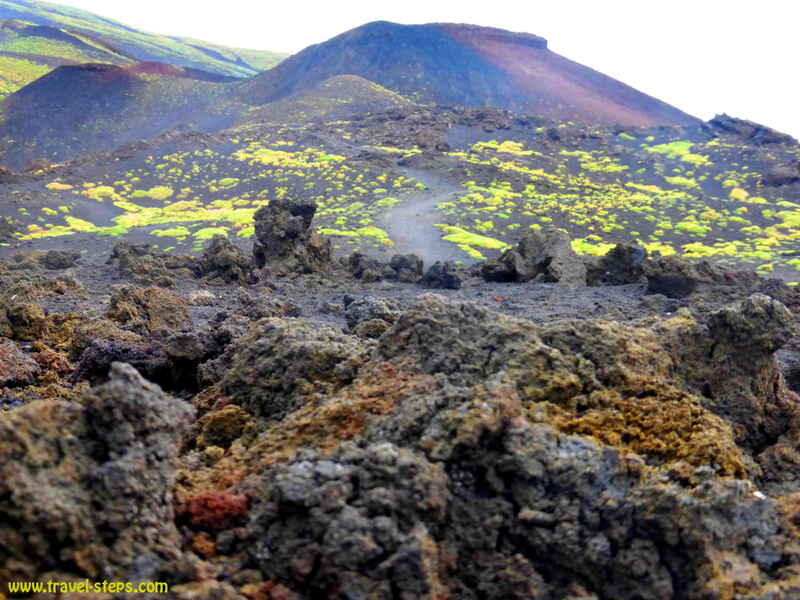 But yes, I saw people on more individual tours hiking to some more hidden parts of the Etna. To do something like that, you need a higher budget and book something in advance – or be just very brave. However you do it, make sure to get there in closed shoes as the ground is uneven and there are sharp stones around. Up there, it is also a bit colder than at the beach. I went there in May and was happy about my raincoat. I got also told, that quite a few guides, tour operators or taxi drivers, that offer tours even online are not licensed and therefore probably lack accident insurance. So better watch your steps while being on a tour. Offering dramatic views on the coastline and the sea from the hill, the town has always attracted artists and writers. It has a special charm. No question: It is nice. But this image attracts a lot of people and makes the prices rise in restaurants and hostels. Being there, I felt like a sheep in the herd following every tourist cliché. The place has a nice, but artificial appeal. It you don’t mind, that you are not the only person around, you will enjoy the atmosphere, the architecture, the souvenir shops, galleries and the artwork offered everywhere, the slightly overpriced food. I had a great day walking around the town, the park and walking down to the small pebble beach. 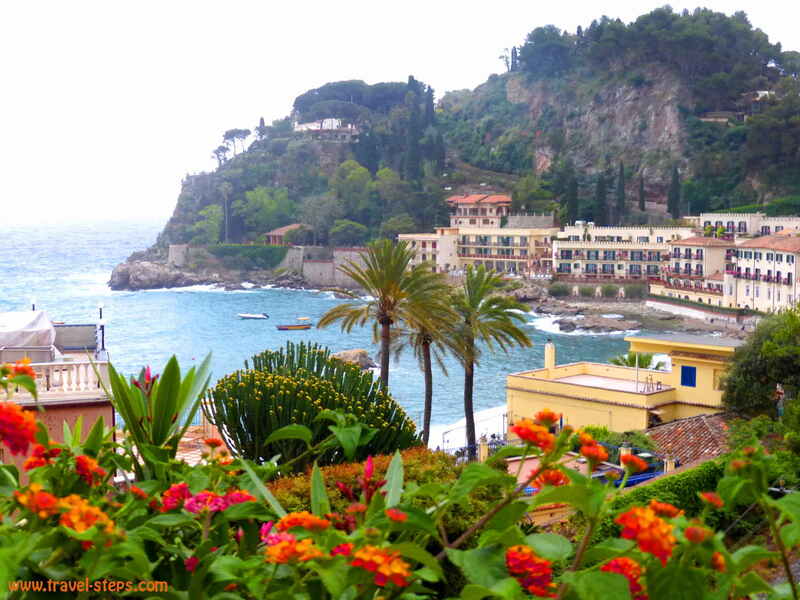 At Taormina’s beach, I walked by a lot of restaurants with great views to visit Isola Bella, a tiny island just offshore. You can walk there, but don’t be afraid to get wet feed. You will. The island is under conservation. And to properly visit the place, you need to pay an entrance fee. Many people just walk there, enjoy the view and get back. After I had walked back, I sat down at the beach for a few minutes to write my diary. In that time, I was asked maybe twenty times by Asian women, if I wanted to have a foot massage. My feet still felt alright, although for going back the hill to Taormina, I took the cable car for 2,50 Euros and got some nice views. I got to Taormina by bus from Catania. It’s easy to go there in the morning and back in the evening. I got the timetables from the tourist information in Catania. I really had problem getting reliable information about bus timetables in Sicily online. In Catania, the buses left from the bus station next to the train station. In May, it wasn’t a problem to buy the ticket at the same day as the bus was not full. In high season, I wouldn’t count on that. Anyway, there are also hostels for travelers on a budget in Taormina. The baroque age still lives in Noto. 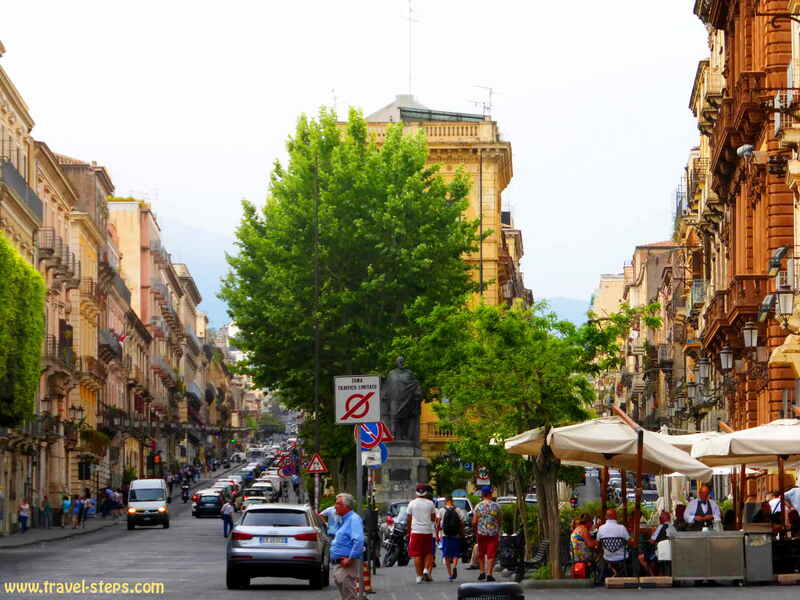 I went there on a day trip from Catania, because everyone had told me, that Noto is the most beautiful place in Sicily with its palazzi and churches, the facades in all shades of orange, yellow and gray. The town invites visitors to walk around for hours, to discover many details, to visit palazzi and to sit down and have a coffee. The town is part of the Unesco World Heritage List. The tourist information was very helpful with maps and sightseeing advise. 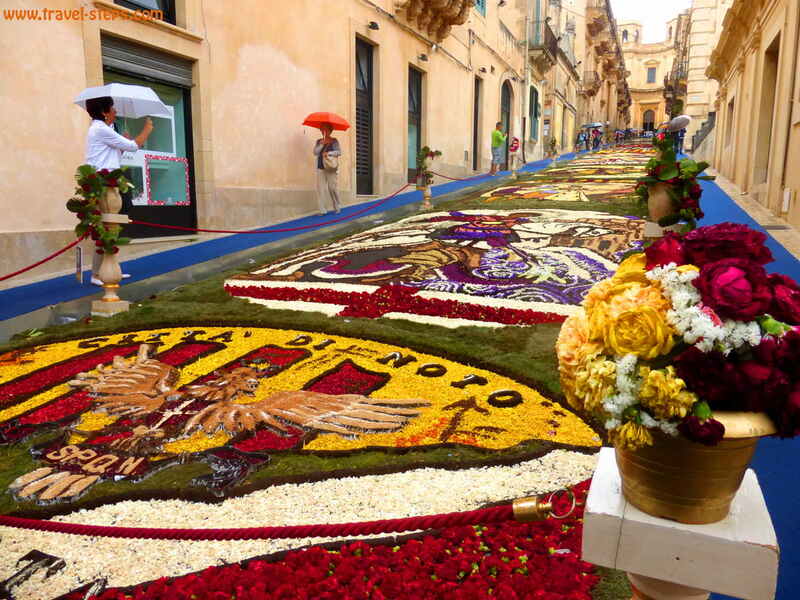 When I was there in spring, I still got to see the Sicilian Flower Festival “Infiorata di Noto”, that takes place every year since 1980. Different artists are given a section of pavement along the architectural beautiful 122 meters long Via Nicolaci right in the town center. They create designs with flowers based on a given theme, that stay for a few days. It was amazing to see the detailed pictures made of flowers, although it was raining. 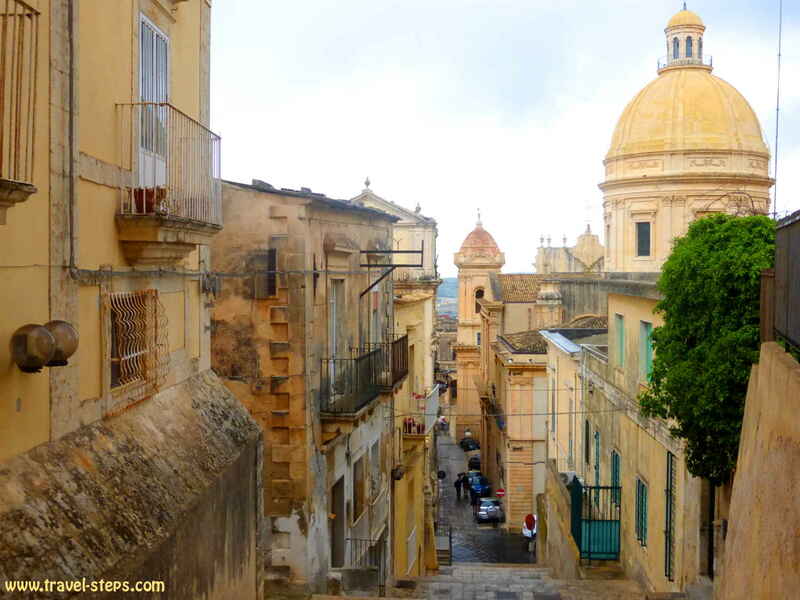 Also Noto is on the Unesco’s World Heritage list because of its stunning architecture. I got off the bus at a random point in the city. My intention was to see Ortygia, the old part of Syracuse. But I got off much earlier. Communication with the bus driver just didn’t work. That’s why. In Syracuse, I got out of my tourist bubble. I went there in May 2015. There were refugees sitting around at public places, in parks. Just everywhere. 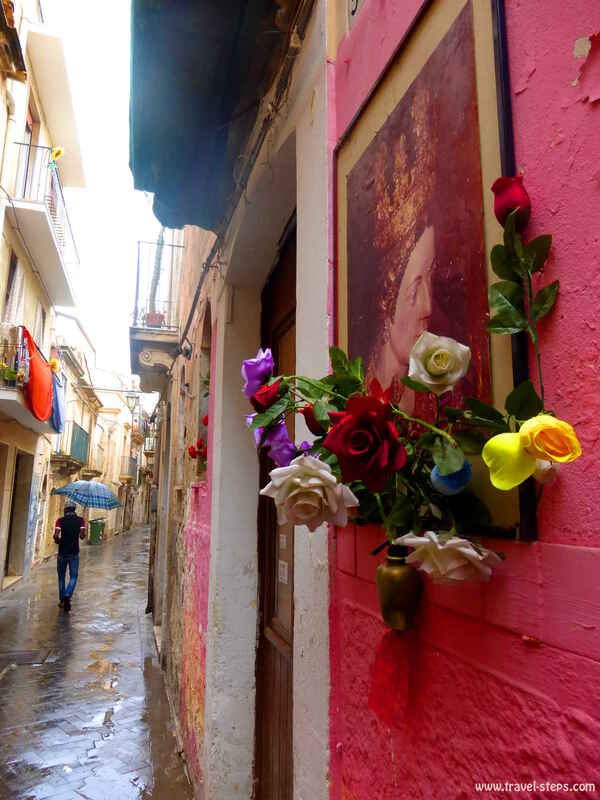 When I came to Ortygia, the old town of Syracuse, I felt like entering a parallel universe full of historical sights and tourists. I walked on to the sights thinking about the contrasts between people. The ones waiting for a better future and the ones having coffees and cakes at the Piazza del Duomo with its beautiful architecture. I decided to spend my day in the tourist bubble, helpless to do anything else than that. I walked around small lanes, saw creatively designed balconies, got lost, but didn’t mind. In Ortygia, there were viewpoints, from where you could see the sea, the old city walls, the harbor, the facades of the past and, but also the multilane streets of a gray modern industrial city in the back. I decided to stay in Ortygia. To step down to the sea, to walk around the streets, to watch the harbor. If you have time and some money to spend, there are lot’s of things to do and to visit in Syracuse. But there is also some free stuff to experience: Read more about Syracuse’s sights on the official tourism website here. Wonderful blog filled with great info! Was wondering if you knew about public transport in Sicily to any of the nature reserves from major cities? I’m contemplating renting a car. thanks a lot! I personally would suggest to email to the official Sicily tourist information for details about public transport to natural reserves. They have many offices, also for example in Palermo, Catania and Siracusa. They should really know. I personally didn’t go to natural reserves by bus. Good luck!! And have a great time in Sicily! Hi Morgan, thanks a lot! 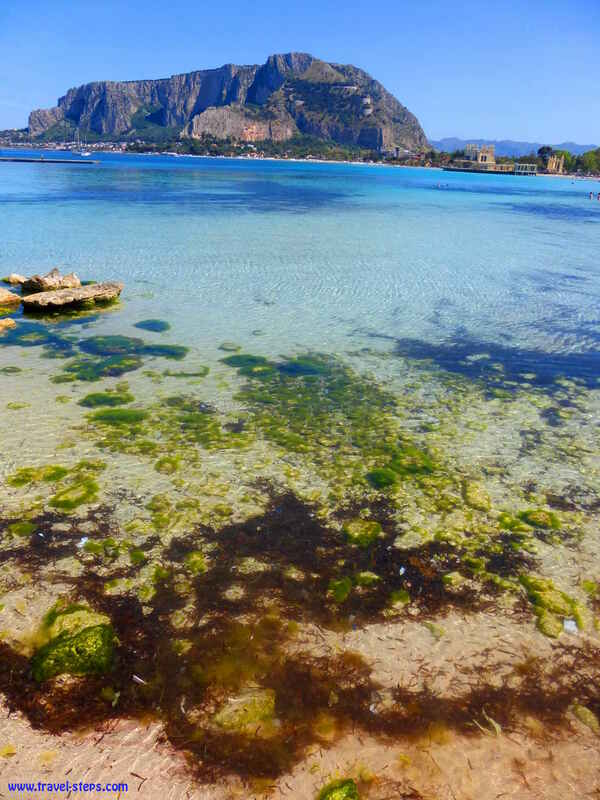 Sicily is a great destination and you are going there at a beautiful time of the year. Have fun, sun, enjoy the good vibes and every moment of your trip!